Central Asia has long been a crossroads of culture, and likely nothing defines this better than the Silk Road which had many branches passing through countries like Kyrgyzstan. As a result of the long history of civilisation in this region, it is possible to come across ancient Scythian burial mounds, stone inscriptions written in Tibetan script, Nestorian churches, stone gravestones carved in the likeness of the deceased, and a myriad of petroglyphs all throughout Central Asia. Unfortunately, a true database of these heritage sites has never been created for many of the Central Asian regions. There are many photographs and lots of location data, but there is not a good database that combines visual data with location data. That is what this project is trying to remedy. With the help of citizen scientists, a unique database of sites with cultural heritage value is slowly, but surely, being built. To date, much of the work being done on this project has taken place in the Kyrgyz Ala Too and Jungal Too mountain ranges. Data collection happens as a side project of the Biosphere Expeditions Tien Shan research project each summer. Have a look below at a simple map of petroglyphs and burial mounds found in this study area. To date, in that area alone, hundreds of unique petroglyphs and burial mounds have been recorded. Since each entry in the database has an image and a GPS location, this provides the opportunity to do some interesting research . 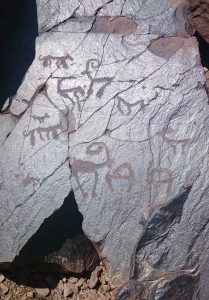 The project is now using petroglyphs as historical species distribution mapping tools. Since most petroglyphs in the area contain depictions of identifiable animals and can be dated (to varying levels of accuracy), historical distribution maps of species like the red deer (Cervus elaphus) can be created. 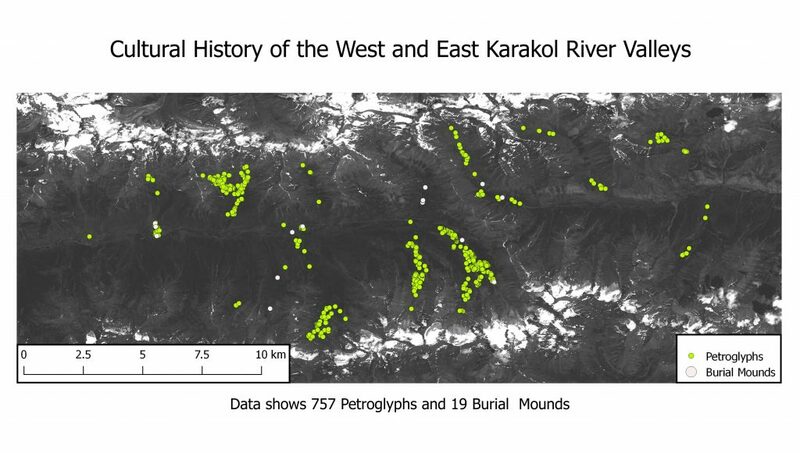 Studying historical distribution data and comparing it to current distribution data can provide interesting insights, especially in the case of the red deer as it is no longer found in this region of Kyrgyzstan.